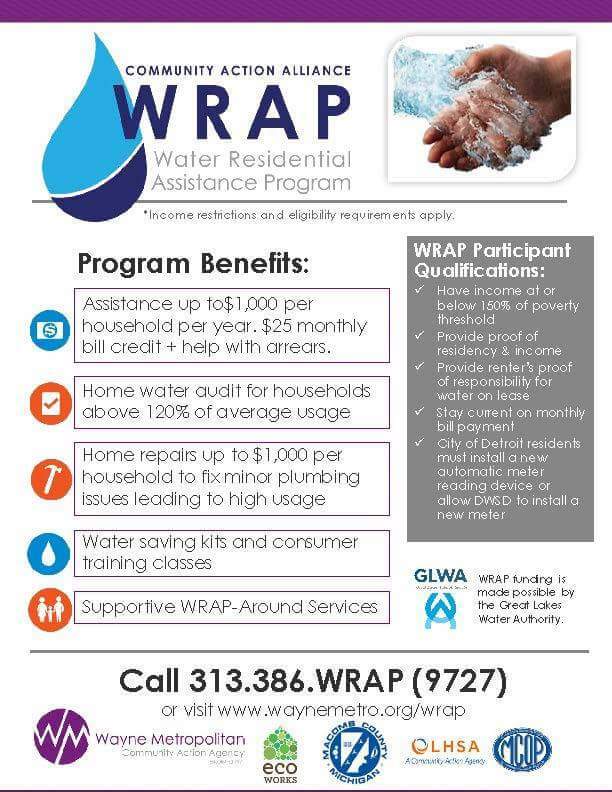 The Great Lakes Water Authority (GLWA) has partnered with community organizations to prevent water shut-offs for low-income Detroit residents. WRAP services available to all counties in Southeast Michigan (Wayne, Oakland, Macomb, Lapeer, Monroe, St. Clair, and Washtenaw). Please contact Wayne Metropolitan Community Action Agency for program eligibility and information. ​you via your preferred contact method regarding your personal request. Legal Aid and Defenders Association, Inc.
​*For family households with more than eight (8) persons, add $4320 for each additional person. The Free Legal Aid Clinic (FLAC) was established in 1965 to provide legal assistance to low-income and elderly residents of Wayne County of Detroit, specializing in the ares of Elder and Family Law. Services provided to victims of domestic violence, elder abuse, or those experiencing extreme barriers to justice. FLAC is a student run legal aid clinic staffed entirely by law students of Wayne State University under the supervision of licensed attorneys. legal aid & defenders, inc.
Utility bill payment assistance programs vary in structure and design as it relates to eligibility, scope of coverage, and time limitations. Programs also utilize different income and asset measurements to determine eligibility for benefits. Energy consumer applicants should be familiar with Federal Poverty Level (FPL) guidelines, the standard tool for determining if the applicant meets the Michigan "standard of need" test. Most, programs require applicants household income to fall 150 - 200% below the national poverty threshold (depending on household size) to qualify for benefits. Use the Federal Poverty Level (FPL) chart to calculate household income eligibility. FPL levels are based on gross income annually. The State of Michigan provides assistance to low-income households who are facing extreme financial hardships and unexpected emergencies for rent, utilities, relocation, insurance,, mortgage or tax foreclosures, home repairs, and more. The State Emergency Relief Program (SER) is not an option for long-term needs. Contact Local Department of Health and Human Services (DHS) apply for State Emergency Relief (SER) funds. *Additional eligibility requirements and approval determined by DHS and other local agencies. Medical Holds: Applications accepted after funding closing date. Learn more about state funding and how community organizations are awarded grants to sponsor utility bill payment assistance programs and other supportive services to eligible Michigan households. Find a MEAP funded agency and services in your area in the list below. Programs: bill payment assistance (up to $2,000 cap), case management, and wraparound services through needs assessment, resource referrals, advocacy, energy education, and budgeting. Coordination of employment services, Veterans Affairs services, weekly fresh food initiative (food pantries), tax preparation, household/financial work plans, and CO detectors. Eligibility Criteria: Contact agency for instructions to apply in person or by phone, must pay 10% or more of current bill (based on 6-month payment history). Does not specify if financial literacy workshops are mandatory. Monthly meetings with financial mentor (based on 6-month energy bill payment history and previous year grant funding) may be required. Programs: bill payment, affordable payment plan enrollment, weatherization, energy efficiency measures, client action plans, financial literacy, energy use education, follow-up services, tax preparation, minor home repair, mortgage assistance, early childhood education and childcare, commodity/emergency food, in-home care, transportation, and clothing. Service Area: Allegan, Antrim, Arenac, Benzie, Bay, Berrien, Calhoun, Cass, Clinton, Crawford, Eaton, Emmet, Genesee, Gladwin, Grand Traverse, Houghton, Ingham, Jackson, Kalamazoo, Kalkaska, Kent, Lapeer, Leelanau, Livingston, Macomb, Manistee, Monroe, Montcalm, Oakland, Ogenaw, Osceola, Ottawa, Roscommon, Saginaw, Sanilac, Shiawassee, St. Clair, St. Joseph, Van Buren, Washtenaw and Wayne counties. (May vary depending on participation of agencies in counties). Programs: bill payment primarily through affordable payment plan enrollment, needs assessment, budgeting, energy efficiency education, job coaching, employment readiness, computer training, general life skills, food, clothing, furniture, transportation, rent, water bills, medical bills, tax preparation, legal aid, returning citizens reentry, long-term case management, referrals for additional wraparound services including dental, child care, weatherization, and EcoWorks Energy Workshops. 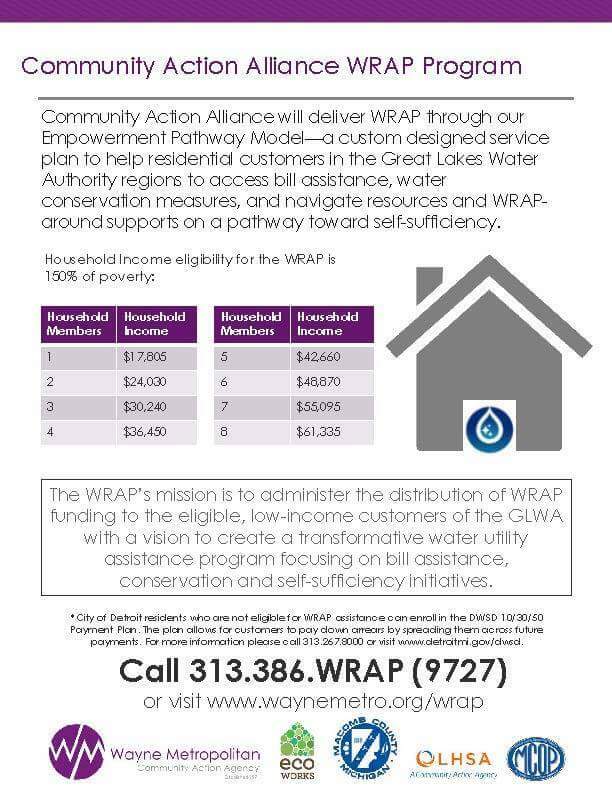 Programs: bill payment assistance (up to 2,000 per household) and affordable payment plan enrollment (SEMCO MAP and DTE LSP) for qualifying households, self-sufficiency services: case management, energy conservation workshops (classes available online, rural mailing, and in-person), budgeting, home energy assessments (limited to 175 households), solar panel installations. Special Note: Must apply for State Emergency Relief (SER) before eligible for services. Hours: M-F, 8:30 a.m. – 5 p.m.
Programs: crisis intervention assistance, crisis prevention assistance, SER copayment assistance, case management, mobile processing at Customer Assistance Day (CAD), energy efficiency education and toolkits, iHeal Families program (energy assistance and support services to medically vulnerable consumers, information and referral: links to self-sufficiency, energy efficiency education, weatherization, and other essential services (food, clothing, and shelter). (Upper Michigan residents, Kent County, Grand Rapids, Muskegon, Kalamazoo, etc). Applications Accepted: All-year round pending funding availability. Special Note: Applicants must apply for State Emergency Relief (SER) benefits prior to eligibility for bill payment assistance. Programs: bill payment (Gaining Proactive Solutions – GPS), case management (Pathway to Hope), Affordable Payment Plan enrollment for DTE Energy and Consumer’s Energy customers, vendor advocacy, energy education, financial counseling, energy optimization and weatherization (by referral). Programs: direct bill payment assistance, affordable payment plan enrollment, waste management education, in-home wraparound services, increasing household income strategies (financial literacy, budgeting, employment, training/education), weatherization and tool kit installation, care coordination for healthcare and behavioral services, success self-sufficiency and and energy security services provided to affordable payment plan enrollment customers through the emPower program. Programs: affordable payment plan enrollment (APP) through CARE, LSP, and MAP programs, one-time utility bill payment assistance, needs assessment and short-term case management for home weatherization, food assistance & other needs, budgeting assistance, one-to-one financial coaching (via phone), private Facebook group access. EARLY ENROLLMENT ENCOURAGED DUE TO LIMITED SPACE. ASSISTANCE ON FIRST-COME, FIRST-SERVE BASIS. Programs: applicants will be required to apply for State Emergency Relief (SER) through United Way of Southeastern Michigan's (UWSEM) MI Bridges Navigators. and complete a self-sufficiency plan. Applicant's will participate in energy education, develop a basic household budget, be referred for financial education, or receive the information electronically. Franklin Wright Settlements 7375 Woodward Ave. Detroit, MI 48202 M ‐ F 9:30 a.m. – 5 p.m.
Catholic Charities of Southeastern MI 76 Williams St. Pontiac, MI 48341 T & Th 9:30 a.m. – 5 p.m.
ACCESS 4301 E. 14 Mile Rd. Sterling Heights, MI 48310 M & W 9:30 a.m. – 5 p.m.
Inpatient rehab vs. outpatient treatment - Which is better? Hearing impaired callers may contact the Michigan Relay Center at 711 or 800-649-3777 and ask for the number above. The City of Detroit Department of Neighborhoods team has been charged with the task of eliminating blight in their district They work closely with neighborhood and other community organizations, CDCs, faith-based organizations, and local businesses to identify and prioritize citizen concerns, then coordinate action with appropriate City departments. They will help you address all blight-related issues including vacant and dangerous buildings, lots, and non-structural blight. Victims and families of homicide victims may complete the confidential Contact Form if in need of a referral for legal representation, medical care, grief counseling and other mental health services.